​just by walking your dog! Sparkle Cat Rescue has partnered with Wooftrax.com to raise money for homeless cats we rescue! Select us as the organization you are walking for. See instructions below. If you don't have a dog, you can select Cassie, the virtual dog. You can also walk with a dog from the local shelter or walk in memory of a dog you loved. Walk for a Dog is a simple, year-round fundraising app! It promotes healthy interaction between dogs and their owners, and raises money every day to support the mission of your favorite rescue or animal shelter. It also gives people a reason to think about their local animal organization every time they take their dogs for a walk. 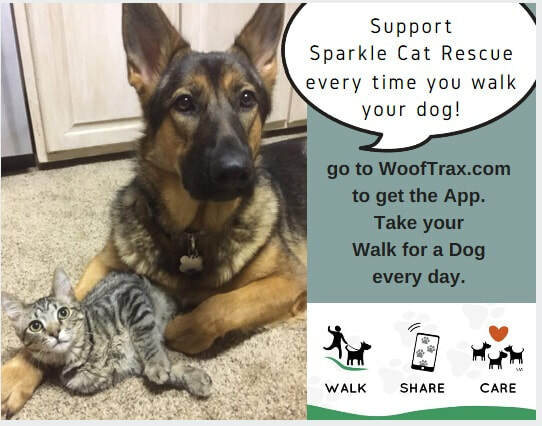 Go to WoofTrax.com, download the app, and support Sparkle Cat Rescue every time you walk your dog. Donations are based on the number of active walkers for Sparkle Cat Rescue in a given donation period. An active walker is anyone who uses the app at least once a week for a minimum of a 1/4 of a mile. Sparkle Cat Rescue loves dogs too! Many of our cats are in foster homes with dogs. This helps prepare them for future forever homes where there may be dogs in the home.